Nanophotonics has been extensively studied with the aim of unveiling and exploiting light-matter interactions that occur at a scale below the diffraction limit of light. 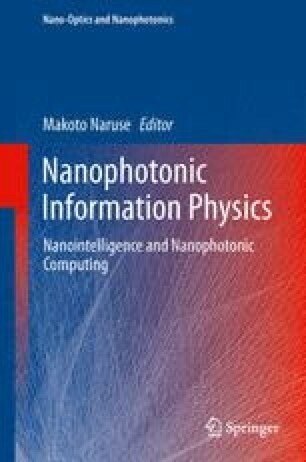 From the viewpoint of information, novel architectures, novel design and analysis principles, and even novel computing paradigms should be considered so that we can fully benefit from the potential of nanophotonics for various applications. In this chapter, we first present some fundamental and emergent attributes associated with optical excitation transfer mediated by optical near-field interactions. Toward achieving a computing paradigm that surpasses the classical von Neumann architecture, we describe stochastic solution searching, which exploits the spatiotemporal dynamics of optical excitation transfer. Second, we show information security applications based on near-field applications, together with their theoretical and experimental foundations. Finally, we present a stochastic analysis of light-assisted self-organized material formation in order to gain a deeper understanding of the underlying physics. We consider that a common feature across all of these demonstrations is the extraction of “intelligent” functions and behaviors from an information-based standpoint—an idea represented by the title of this chapter, “nanointelligence”. The authors would like to thank many collaborators for illuminating discussions over several years, in particular H. Hori, T. Kawazoe, T. Yatsui, W. Nomura, K. Kobayashi, K. Akahane, N. Yamamoto, T. Inoue, F. Peper, K. Leibnitz, M. Hoga, Y. Ohyagi, T. Matsumoto, L. B. Kish, C. Lienau, E. Runge, S. Huant, and S.-J. Kim. This work was supported in part by Grants-in-Aid for Scientific Research from the Japan Society for the Promotion of Science (JSPS) and the Strategic Information and Communications R&D Promotion Programme (SCOPE) of the Ministry of Internal Affairs and Communications.